Wes McDowell is a web strategist for The Deep End. 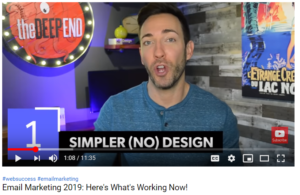 He has created a helpful video on email marketing for 2019. 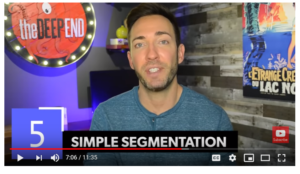 He starts out with a statistic to get you enthused about your email marketing techniques. For every $1 a company spends on email marketing, they receive $44 on average in return. This makes email marketing an incredibly powerful marketing tool. He provides six main tips for email marketing. Every time you are putting together a new email for a client, they may want to create a fancy design. Email providers tend to have fancy templates. However, when they hit your inbox, they look like one big commercial. No one emails their friends and family with a fancy template. Therefore, when you get an email without a design, you don’t automatically disregard it as marketing. This helps you to casually slip into your customer’s inbox as a friend or a helpful person that they can trust. Send out boring, old, plain text emails. These emails are much more likely to be read because they look like a genuine email you would get from friends and family members. Another great reason to ditch the templates is that they are a great way to be sent to your promotions filter instead of the email inbox. Remember, keep the images and links in the email to a minimum. No more than one link and preferably no images. One way to add an image to the email to make it look special is to add a GIF. This can make it more fun and memorable. Rather than simply delivering a tip or advice in the email, make it even more impressive with a story. There are whole parts of your brain that will light up when you hear a good story. It also makes it more relatable and personable. Rather than just sharing how clients can sell their homes faster by staging their home, share a story about a past client that refused to do that and how their house sat on the market for a long time until they gave in a did. Then their house sold for $10K over the asking price. Share the emotional roller coaster that went along with the story, such as how you felt and how your customer felt going through the experience. Start incorporating video into your email marketing. Don’t simply put a video in the email, but include it in the subject line to improve your open rate. Not only will it increase your open rate, but people will be more likely to consume your content and absorb your message. People like video format versus plain text. Almost everyone is more likely to retain information when they are seeing it and hearing it. 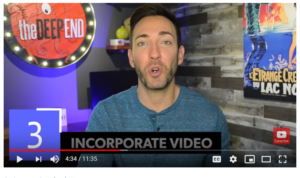 You can do this by taking whatever content you were going to put in your email and creating a short video. It really doesn’t have to be high production value either. That can trip up a lot of clients. Some people think they have to get a whole camera crew and spend hundreds of dollars on a video. You can use your smartphone, and do a short selfie style video. It will convert just fine. You’ll get your point across. Finally, just upload it to YouTube. 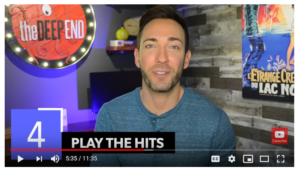 Get a screen capture of your thumbnail and link it to your video. Many small businesses get intimidated when they start to think about putting together an email campaign. More often than not, they already have content that they can string together into a series and set it up once. Then it gets automatically sent out to new subscribers the moment they end up opting into it. A new subscriber will opt in today with a new email every week until that series is over. If you already have great blog posts, webinars, or interviews, you can use those in your email campaigns. If you don’t have any content yet, that’s okay. Just keep writing one new email per week for as long as you think the series should go for. Split up the content here and there. Include some blog posts, some videos and some tips. You could link out to content that you had nothing to do with creating, just put your own spin on it in the body of the email. Another thing that is working right now is a simple segmentation. Let’s say your business has a variety of services or types of products that interest different customers. For example, a landscaper may offer tree removal service, landscape design and weekly lawn maintenance. You could create three different lead magnets that are specifically geared toward each service. Then design an email sequence specifically for lawn care, design maintenance, etc. This is really powerful because these are two different types of customers that have a different goal in mind. If you sent out a mixture of those topics to all of your customers, many of them may start to unsubscribe. Another approach is to have one overarching umbrella freebie that is interesting to everyone. Then when they are downloading their freebie, you could have an option for them to indicate which service that they’re most interested in. Your email provider would see which box they checked and that would put them on the email list for landscape design or tree removal service. When it comes to email marketing, it can be great to have a big list. However, quality is just as important. You want your list to be full of people who actually open your emails are excited to hear from you. If you have a big list of people who aren’t really opening your email, you run a high risk of having your emails flagged as spam. You could also get high unsubscribe rates. These are really bad signals to email providers. Email providers that notice you get a lot of unsubscribes and are sending spam will not deliver the emails to the inbox. Your emails may end up in the promotions tab or the spam folder. If someone flags you as spam, they won’t hear from you anymore, but it will also impact the people who liked hearing from you. You’ll end up in their spam folder too. Another advantage to having a smaller, more engaged list is that email marketing providers charge for the number of people on your list. The larger your list, the greater the cost. Before you start kicking people off your list, you should run a simple re-engagement campaign. Segment people who haven’t opened your emails in 90 days. Send out 4 value based emails with pure value. Drip out those emails over two weeks. Anyone who hasn’t opened your emails during those two weeks probably isn’t interested anymore. Now is the time to kick them off your list. This can sound counter-intuitive if you don’t have a large list, but by getting rid of the people who don’t want to hear from you, it improves the deliverability of the people who do want to hear from you. After providing all these wonderful tips, Wes McDowell concludes by asking you what is stopping you from building your email list? He also offers a free course on how to guarantee website ROI. This is a great video and well worth twelve minutes of your time. I highly recommend it! This is really helpful. Thanks for posting this. Email marketing is not what it used to be. It’s getting harder to get our messages read unless a few years ago. What Wes McDowell has taught is fantastic!